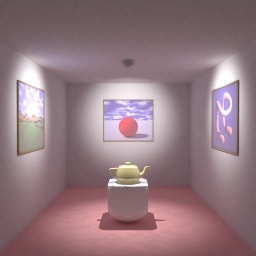 The problem of global illumination can be solved using path tracing. Unfortunately path tracing gives very noisy images. This noise is mostly caused by the indirect illumination reflected diffusely. The common way to reduce the noise is to use more samples/rays pr. pixel. However, the convergence speed in path tracing makes this strategy very costly. In this paper we propose a technique in which light reflected diffusely two times is separated from the final solution. This light is filtered by different noise reduction filters and then added to the remaining solution. In this way we avoid blurring the image and at the same time we are able to reduce the noise level significantly. Key Words: Global illumination, path tracing, noise reduction, filtering. Henrik Wann Jensen and Niels Jørgen Christensen: "Optimizing Path Tracing using Noise Reduction Filters". In Proceedings of WSCG 1995, pp. 134-142, 1995.